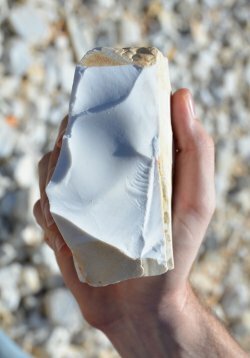 White novaculite, modern whetstone quarry. Water-filled quarry pit, historic quarry site, Garland County. Water-filled quarry pit, modern whetstone quarry, Garland County. Novaculite boulder, modern whetstone quarry, Garland County. Drill hole for black power blasting. 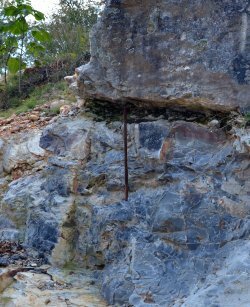 Metal drill bar left at novaculite outcrop. 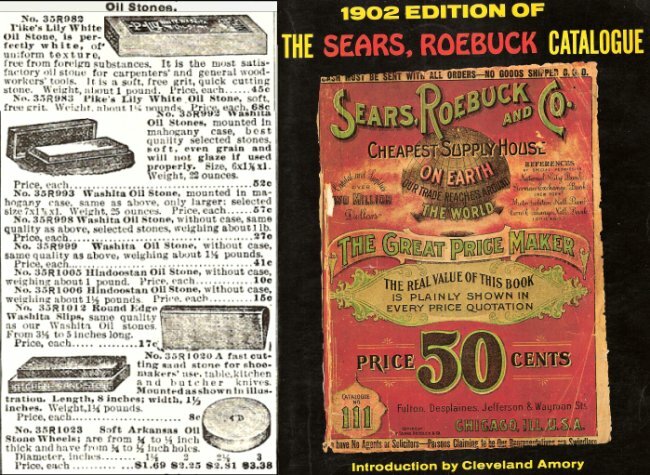 In 1902, novaculite whetstones were marketed as Washita Oil Stones or Arkansas Oil Stones. Novaculite is best known for its use as whetstones and other abrasives. 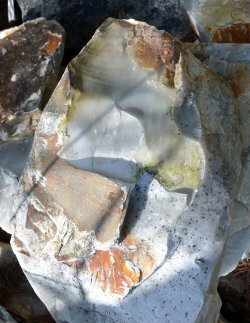 Since the early 1800s, novaculite has been quarried from bedrock deposits around Hot Springs, Arkansas, and cut into whetstones for sale across the country. Whetstones are pieces of rock used to sharpen knife blades or other metal-edged tools (“whetting” is sharpening by rubbing on a stone). The earliest anecdotes of mining novaculite for whetstones in the Hot Springs area date to 1818-1819, according to geologist L. S. Griswold. When George William Featherstonhaugh visited Hot Springs in 1834, he noticed residents using local novaculite “as hones for their razors,” as he recounted in his 1844 Excursion through the Slave States. Indeed, the name for novaculite comes from the Latin word for razor. David Owen wrote that novaculite was mined in the Hot Springs vicinity in 1860 for cutting into whetstones both locally and out of state. Novaculite – also known as Ouachita oilstone and Arkansas whetstone – was “quarried extensively to supply the neighboring Whetstone mills; but the greater quantity is transported to mills located at New Albany, Indiana, where it is sawed and fashioned into whetstones of every description, and razor honestones; the finer and harder varieties are reserved for the use of the engraver,” (Owen 1860, p. 103). Novaculite boulder and debris at a modern whetstone quarry. 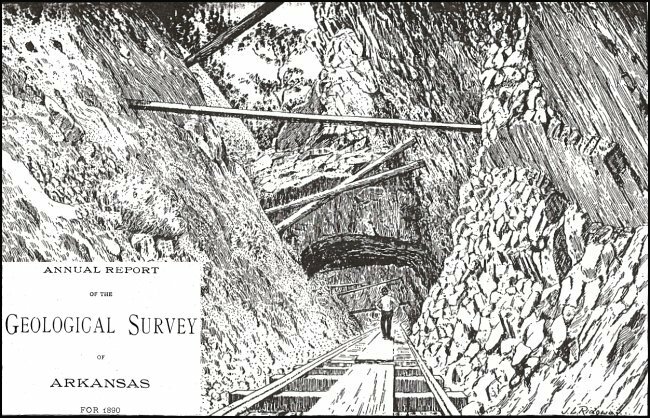 By the end of the nineteenth century, the Arkansas Geological Survey was studying resources across the state that had potential commercial value. L. S. Griswold’s 1892 report, "Whetstones and the Novaculites of Arkansas," was an in-depth treatise on novaculite geology and the whetstone industry in Arkansas. Griswold presents details of production, for example reporting that over 300 tons of novaculite were shipped annually from Hot Springs by 1875. Active whetstone quarries at the time included operations by Hiram Whittington, J. J. Sutton, and the Barnes Brothers. Much of the output was shipped out of state for sawing into whetstones. The Pike Company, located in New Hampshire, was the main manufacturer and dominated the whetstone industry in the 1800s. By the twentieth century, composite and synthetic abrasives were increasingly chosen for industrial grinding, but natural whetstones were still in demand for hand-sharpening and finishing of metal-edged tools. By mid-century, there were several local whetstone manufacturers in Arkansas. David Whittington lists the Hot Springs Oilstone Company, Hiram A. Smith Whetstone Company, and the Norton-Pike Manufacturing Company as the main producers. Whittington’s summary of the history of whetstone mining was published in 1968 by the Garland County Historical Society and in the 1969 Arkansas Historical Quarterly. 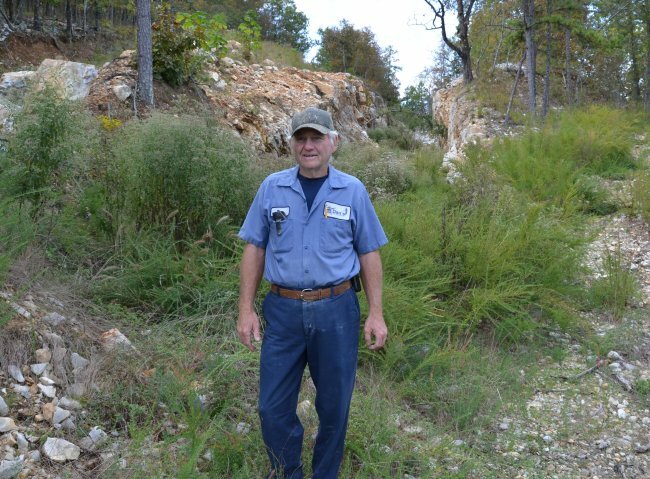 Dan Kirschman of Dan’s Whetstone, at a novaculite quarry trench that has been worked for over 100 years. 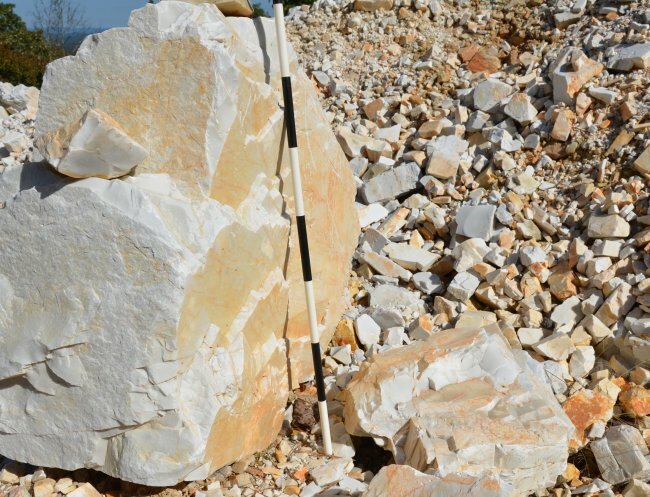 Novaculite is still mined for whetstones in Arkansas today by companies such as Norton Saint-Gobain, Smith Abrasives, Dan’s Whetstone Company, and Magnet Cove Stone Company. For video of several steps in that process, take a look at a recent story broadcast by KARK-TV that featured Dan’s Whetstone Company. Novaculite is also crushed for gravels and rock aggregate used in construction. A form of weathered novaculite called “tripoli” has been marketed as an abrasive. Novaculite has seen industrial use as an additive to paints and to plastics, and is used in industrial coatings manufactured by Malvern Minerals Company. 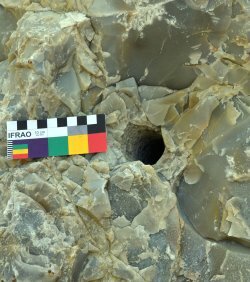 In recent decades, some novaculite has also been sold to flintknapper hobbyists who want to learn and practice ancient toolmaking techniques. 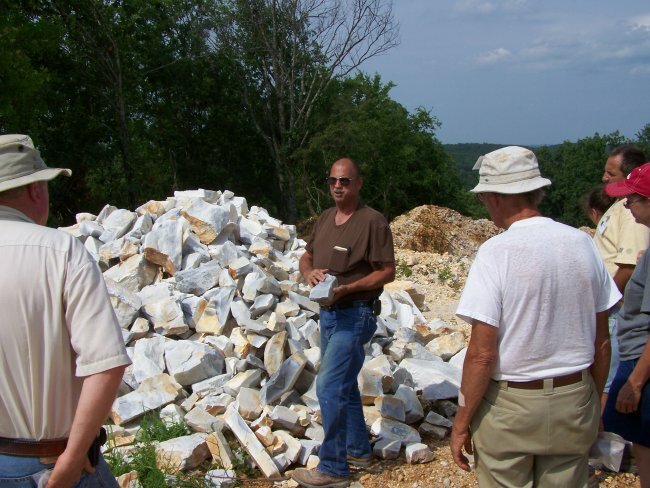 Robert Parker (Magnet Cove Stone Company) provides a whetstone quarry tour to Arkansas Archeological Society members in 2007. Many of the large-scale quarries left from 19th century whetstone mining have now been recorded as historic archeological sites. How do we tell the difference between quarries left by Indians mining novaculite thousands of years ago for stone tools and Arkansans mining novaculite for whetstones two hundred years ago? We should see differences in mining tools and techniques. Novaculite was quarried for whetstones using metal tools, drills, and black powder charges, sometimes leaving distinctive traces. Remnants of machinery and road beds might remain. 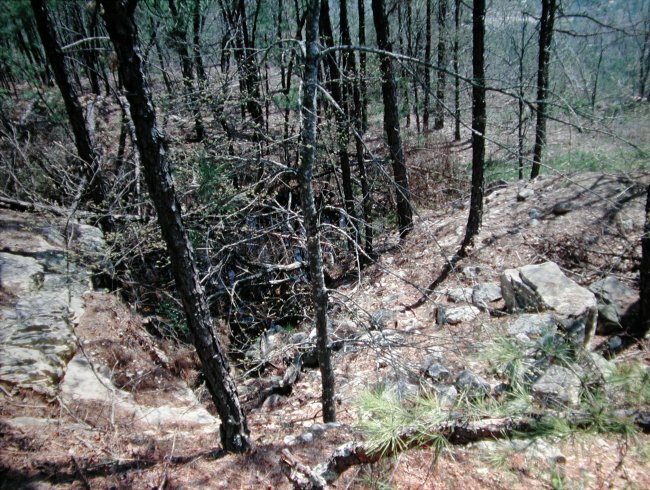 Mary Beth Trubitt (Arkansas Archeological Survey) documented rectangular quarry pits that were deep (and often filled with water) as evidence of historic mining at one Garland County quarry in 2002. An 1892 illustration of a novaculite whetstone quarry (Griswold 1892, Plate VI, Arkansas Geological Survey). One project suggested by Trubitt, Green, and Early in their 2004 novaculite research design still needs attention: documenting the history of novaculite whetstone mining, a significant Hot Springs industry in the 19th-20th centuries, through archival and archeological research. Archeological sites on federal and Indian lands are protected by federal laws. The Archaeological Resources Protection Act sets penalties for unauthorized digging at or damaging sites on public lands or removing artifacts from these historic places. It also sets up procedures for permitting qualified professional archeologists to conduct research at sites on public lands. State laws protect archeological sites on state-owned lands in Arkansas as well. Please help to preserve these large and significant archeological sites. The novaculite quarry pits and tools left behind can tell us the unwritten history of this ancient industry. These sites are part of America’s heritage! 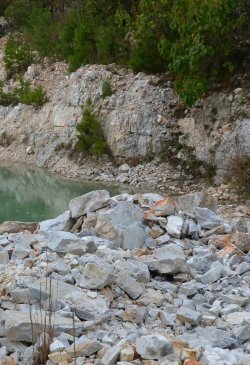 Site visits to photograph novaculite quarries as part of this website project have been made with permission from the Ouachita National Forest, Hot Springs National Park, Arkansas State Parks, and individual property owners. 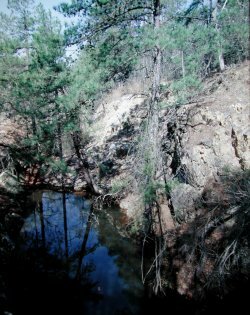 Water-filled quarry pit at a historic novaculite quarry in Garland County. Griswold, Leon S. (1892) Whetstones and the Novaculites of Arkansas. In Annual Report of the Geological Survey of Arkansas for 1890, Volume III. Press Printing Company, Little Rock, Arkansas. Holbrook, Drew F. and Charles G. Stone (1979) Arkansas Novaculite – A Silica Resource. Reprinted from Thirteenth Annual Forum on the Geology of Industrial Minerals, Oklahoma Geological Survey Circular 79, by the Arkansas Geological Commission, Little Rock, Arkansas. Howard, J. Michael (2011) Crushed Stone Mining. The Encyclopedia of Arkansas History & Culture. http://www.encyclopediaofarkansas.net/encyclopedia/entry-detail.aspx?entryID=5955. Howard, J. Michael (2011) Mining. The Encyclopedia of Arkansas History & Culture. http://www.encyclopediaofarkansas.net/encyclopedia/entry-detail.aspx?search=1&entryID=5042. Owen, David Dale (1860) Second Report of a Geological Reconnaissance of the Middle and Southern Counties of Arkansas, Made During the Years 1859 and 1860. C. Sherman & Son, Philadelphia. Pennington, Helen (2013) Novaculite. The Encyclopedia of Arkansas History & Culture. http://www.encyclopediaofarkansas.net/encyclopedia/entry-detail.aspx?entryID=2220. Steuart, Charles T., Drew F. Holbrook, and Charles G. Stone (1982) Arkansas Novaculite: Indians, Whetstones, Plastics and Beyond. Arkansas Geological Commission Miscellaneous Publication 18:119-134. Topping, Robert L. (1985) The Norton Pike Story. Outlook Magazine, Fall, 1985, pp. 18-21. Available at http://whitemountainhistory.org/uploads/Pike_History__Fall_1985_rev.pdf. Trubitt, Mary Beth (2005) Mapping a Novaculite Quarry. Caddoan Archeology Journal 14:17-33. Trubitt, Mary Beth, Thomas Green, and Ann Early (2004) A Research Design for Investigating Novaculite Quarry Sites in the Ouachita Mountains. The Arkansas Archeologist 43:17-62. Whittington, David B. (1968) Arkansas’ Oldest Industry. The Record (Garland County Historical Society) IX:29-35.